The Charleston Music Hall and Awendaw Green present Grass in the Hall, the first night of the Piccolo Spoleto Bluegrass Series. 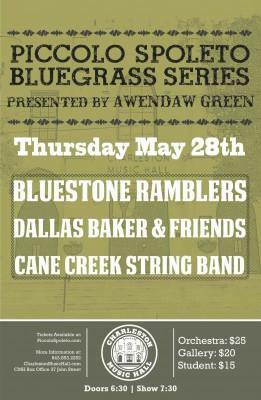 Included in the opening night’s lineup are Charleston’s best pickin’ bluegrass bands: Cane Creek String Band, Dallas Baker & Friends, and The Bluestone Ramblers. Nothing could be finer than hearing the “Sounds of the South” in one of the best listening rooms in the city.